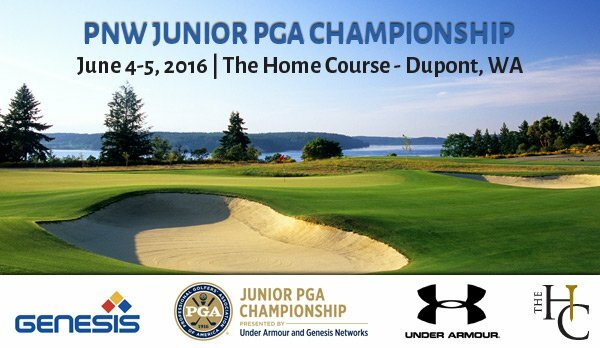 Tumwater, WA (June 5, 2016) – Ellie Slama of Salem, OR and Spencer Tibbits of Vancouver, WA won the 2016 Pacific Northwest Junior PGA Championship presented by Under Armour and Genesis Networks on June 4-5 at The Home Course in Dupont, WA. 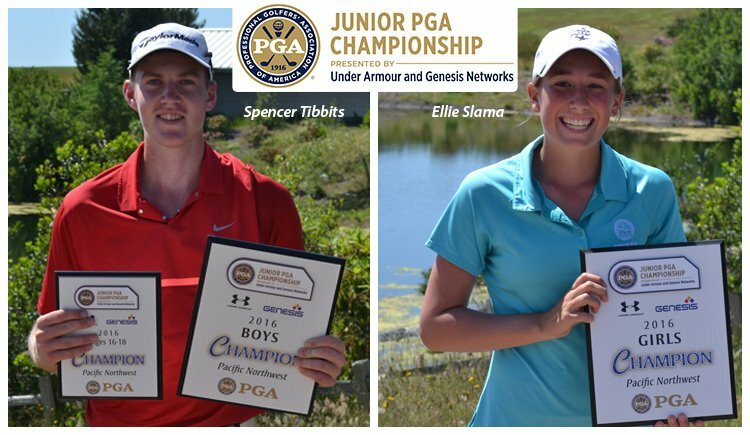 By winning the boys’ and girls’ divisions respectively, Tibbits and Slama qualified for the 41st Junior PGA Championship presented by Under Armour and Genesis Networks, Aug. 9-12 at Wannamoisett Country Club in Rumford, Rhode Island. Slama, 17, had a final-round 70 for a two-day total of 139 and a 13-stroke victory over Brittany Kwon of Bremerton, WA and Jalayne Martinez of Pasco, WA. Tibbits, also 17, posted a final-round 72 for a two-day total of 143 and won in a playoff against Joe Highsmith of Lakewood, WA and RJ Manke also from Lakewood, WA. Tibbits won on the third extra playoff hole. Tannica Porter of Eugene, OR won the Girls 13-15 age division after scores of 77-77-154 to win by one stroke over Lauryn Nguyen of Seattle, WA. Scotty Kennon of Bandon, OR won the Boys 13-15 age division with rounds of 74-69-143 by four strokes over Victor Wang of Sammamish, WA. Suzanne Tran of Poulsbo, WA won the Girls 12 & Under by one stroke with scores of 82-89-171. She won by one stroke over Grace Lee of Bellevue, WA. Daniel Kim of Mukilteo, WA won the Boys 12 & Under with rounds of 71-70-141 to win by three strokes over Graham Moody of Vancouver, WA. The Boys 16-18 played the black tees at 7037 yards. Boys 13-15 played the white tees at 6088 yards. Boys 12 & Under played the gold tees at 5442 yards. The Girls 16-18 played the white tees at 6088 yards. Girls 13015 and Girls 12 & Under played the gold tees at 5442 yards. The 41st Junior PGA Championship presented by Under Armour and Genesis Networks, is open to one boy and one girl champion from each of the 41 PGA Sections, champions of the eight PGA Junior Series events, select national junior tournaments conducted throughout the year and special invitees who have not reached their 19th birthdays as of the final round of the championship. Celebrating its Centennial, the PGA of America represents the very best in golf. For more information about the PGA of America, visit PGA.org, follow @PGAofAmerica on Twitter and find us on Facebook.